Choosing a supplier for your dropshipping business is one of the most important decisions you’ll make. If your supplier screws up, it’s your responsibility to make it up to your customer, not theirs. You want to make sure you choose someone who will have your back. What makes a great dropshipping supplier? Not all dropshippers are great at what they do. However, there are a few keys to finding the diamonds in the rough. Before we discuss how to find your dropshipper, let’s take a look at what a great supplier looks like. One thing I personally look for in a dropshipping supplier is an awesome sales rep. I want to know that I can call them and get my questions answered as fully as possible, and that they’ll know how to handle any issues I have. Don’t get me wrong; no one is perfect and there will be questions they can’t answer right away. But they should be willing to find the answers for you and get back to you in a timely manner. Most dropshippers charge a “per-order” fee. This is a fee you have to pay every time you place an order with them. It makes sense because they have to take the extra time and resources to pack and ship your order for you. However, sometimes wholesalers take advantage of this and charge outrageous fees. They could range anywhere from $2 to $10. Whether or not this is high depends on the profit margins you’re making on your products. My advice is to do the math and see whether you can still make a good profit when dealing with a high fee. If not, keep looking. If your supplier takes more than 24 hours to ship an item (48 at most), then they will not be a good fit for you. Dropshipping is an overly competitive market—there is no room for a lengthy shipping process. The competition will beat you if yours is too long. On the flip side, if you can find suppliers who ship very quickly, you’ll gain a competitive edge. To find the best dropshipping companies, I recommend placing a test order before you make your final choice. As we talked about earlier in the section on finding a product to dropship, finding the best dropshippers means finding the dropshippers selling the best products. I can’t even think of any downside to selling a quality product, other than perhaps lower margins. However, the benefits above will mean more profit for your business over time than you would ever get from selling the high-margin but low-quality product. The latest tech in automation, efficiency, and scalability are going to be increasingly important to you as your dropshipping business grows. While not important right out of the gates, you’ll want to try picking suppliers with the endgame in mind. Of course, not all dropshipping companies are going to have these advanced features. Don’t count one out just because they don’t have a beautiful website—just keep these things in mind during your search. In the section on finding a product to dropship, I talked about how selling brand-name products is probably a bad idea. This is true for beginners. However, as you advance as a drop shipping business owner, this may be a category you want to tackle. If you think you’ll eventually want to sell name-brand products, this is a factor to consider when choosing a supplier. Now you know what to look for, but how do you actually find great dropshipping suppliers? Are there any step-by-step methods to follow? Of course, whenever the need for finding information arises, the first source we go to is usually Google. 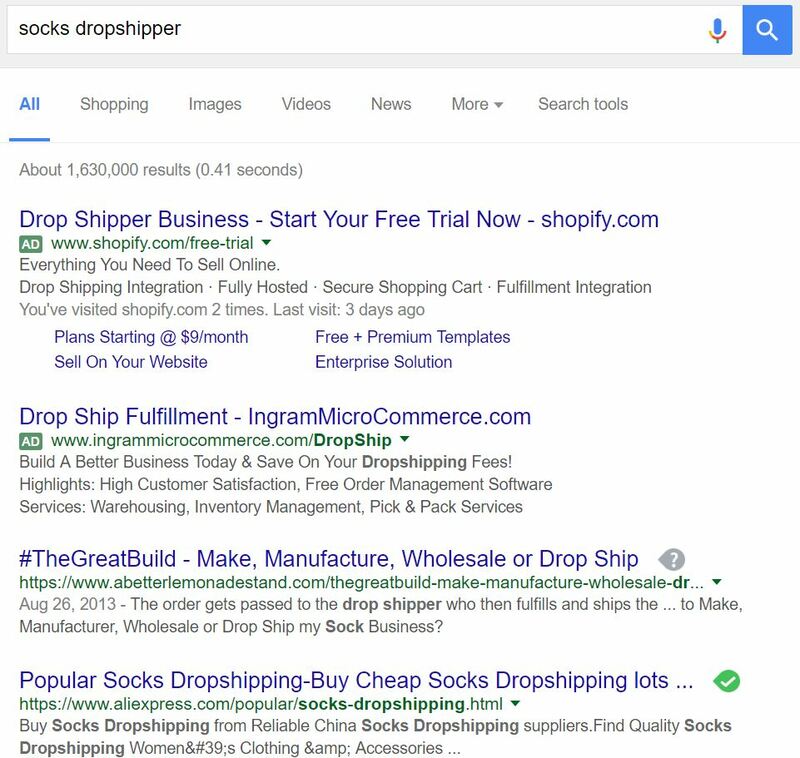 Google is a fast way to find wholesale dropshipping companies, but it also comes with its own risks and downfalls. Phew—1.6 million results. What’s worse? You have no idea how trustworthy any of these sources are. You’ll have to put each one of them through a strict vetting process (which I’ll cover briefly in the next section of this post). This takes time and comes with a lot of inherent risk. I definitely wouldn’t recommend using Google to find your dropshipping suppliers. Why? Because the key to making great money as an eCommerce business is buying products low and selling them high. The best suppliers are busy supplying and don’t have time to work on marketing or SEO, so they’re likely to be buried very deep in the search results. In fact, that’s why SaleHoo was born! SaleHoo was created by a couple of eCommerce store owners who were fed up with the difficulty of finding great suppliers, and the ease of falling into a scam. If you’re ready to find great drop shipping suppliers who are reliable, legitimate, and affordable, learn how SaleHoo can help you now. Alternatively, you can also check out our fully categorized list of 60 dropshippers. Once you’ve built a small list of potential drop shipping wholesalers or manufacturers, it’s time to reach out to them to see if they’ll be a good fit. Email them first. It’s much easier to get the information you need via email than phone. An email will get you all the information you require without time wasted sitting on the phone waiting. Not sure what to ask in the email? SaleHoo members get a list of free email templates to ensure you come across as professional and get all the info you need. The supplier contact emails will also save you time and increase the likelihood a supplier will respond to you. Follow up with a call. After you send the email, increase your chances of a response (and learn more about how good a supplier’s support reps are) by sending them a follow-up phone call. Be prepared with a list of questions. The key to steeling your nerves and sounding like a professional is being prepared. Questions help you learn more about your supplier, see if they’re a good fit, and show you’ve done your homework. 1. What are the payment terms? Are they negotiable? This is a pretty basic question. It will help you see their true pricing (the price listed on their website is often higher than what they actually charge) and get the best deal. 2. Are there any costs besides the direct cost of the product? Some suppliers charge delivery fees, fuel surcharges, restocking fees for returns, or duties on imported goods. It’s good to know what you’re getting into ahead of time. 3. Do you sell direct? It’s not uncommon for suppliers to sell directly to consumers in addition to selling dropshipping services. You should know this before you choose them because if the answer is yes, you are competing directly with your supplier—which could make things difficult. Sometimes customers make mistakes and order the wrong item, and sometimes suppliers accidentally ship the wrong item. It’s going to happen—you want to know how your supplier will handle this situation. 5. What is my expected gross margin? Gross margin is business speak for the amount of money you make after you sell something minus the item’s cost to you (also called the gross profit margin). Even if you set your own prices, your supplier should be able to tell you what other sellers are making, on average. 6. When might prices change? It’s not uncommon for a supplier to spring a price change on you out of nowhere. A major shift like this can be detrimental to your business, so it’s important to know when this might happen ahead of time. 7. What kind of warranty or guarantee does the product have? In order to offer your customers a great return policy for malfunctioning products, you need to know what kind of warranties your supplier gives you. 8. Can your service representatives answer my product questions? While not 100% necessary, it’s good to know how heavily you can rely on your supplier to answer your questions about the product. The more complicated the product, the more important this becomes. 9. Do you have a data feed? Remember when I mentioned data feeds in the “invested in technology” section? It’s good to know if your supplier supports data feeds so you can easily update your store without manually entering information like quantity, descriptions, images, etc. 10. Can you manufacture custom items? Part of being a store owner in the long haul is improving upon existing products to give yourself a competitive edge. If you ever plan on creating your own unique products, you’ll need a supplier or manufacturer who can customize your items. Remember: If you need help sending emails to potential suppliers, SaleHoo members get access to all of our supplier outreach email templates. They’ll save you time and increase the likelihood a supplier will respond to you. Don’t come across as a newbie. Wholesale dropshipping suppliers and even manufacturers are looking for people who are in it for the long game. Whether you believe you’ll be running your online store in 10 years or not, you still want to come across as such. If you sound like a newbie (i.e. like you don’t know what you’re talking about), suppliers will charge you higher prices or not even respond to you at all. My best advice on sounding professional: use the email templates, do your homework, and ask questions. If you do these things, you’ll get the best deals and the best suppliers. Unfortunately, not all dropshippers have your best interests in mind. There is no shortage of people out there looking to steal your money. The easiest way to avoid fraud is to use the SaleHoo supplier directory. It’s only $67 per year and we have a 60-day, no-questions-asked money-back guarantee. But, I won’t push you ... much! While some legitimate suppliers charge monthly fees, some are only looking to take your money. The easiest way to avoid this fraud is to find out why they charge the fees. If the reason sounds honest, it probably is. The bottom line? Do your research. If a supplier deals strictly in bank transfers, turn the other direction. Over 99% of serious suppliers will accept credit or checks. The SaleHoo directory automatically checks and displays these metrics for you. Every legal supplier must display an address, so not showing an address is a huge red flag. SaleHoo lists all supplier addresses right on their page. The Better Business Bureau is a US-based nonprofit that keeps businesses in check. It’s a place where people can go to report frauds. The BBB will also take legal action against illegal or unethical business practices, so it’s a great way to see a company's dirty laundry, so to speak. Just go to their website, search for the supplier, and see what comes up. They may not have information on every business, but it’s still a good source to check. The SaleHoo directory automatically checks and displays every US supplier’s BBB rating. A young domain name likely means a new business, which (in terms of suppliers) often means a scam. Most suppliers have seen a thing or two and been around awhile. The SaleHoo directory automatically displays the number of years each supplier has been in business, but you can check the domain age of other supplier websites using the Domain Age Checker tool. If someone had a bad experience with a supplier, they likely wrote about it somewhere online. The easiest way to find these writings is by searching for “[Supplier Name] + Scam” on Google. Oftentimes, if the supplier is running a scam, you’ll find out right away in the results. One of the quickest and simplest ways to spot fraudulent suppliers is by calling them. Ask them the questions I laid out above. If they stutter or have difficulty answering, it should raise some red flags. In many cases, the phone number won’t even work. If their address doesn’t show up or isn’t actually their place of business, that’s a big no-no. Check out the street view on Google Maps to get a look at their building. Does it look like a distribution center or just some house—or some other business entirely? We show you the address of every supplier in the SaleHoo Directory to make this step easy. Normally, every manufacturer has a list of all the wholesalers and suppliers they sell to. If the manufacturer of the product doesn’t have their name, there’s a good chance they’re not legitimate. I alluded to this a few times above. Making a small test order is a great way to determine the skills of a supplier as well as ensure they’re not a fraud. Congratulations, you’ve now (hopefully) found your ideal supplier! You’re one step closing to creating a successful dropshipping business. But you’re not done yet—head on to the next section to find out what the day-to-day operations of running a dropshipping business look like, and how you can market and grow your new online shop.